The three British citizens killed in the Germanwings plane crash have been identified as a student, a businessman and a seven month old baby boy. Paul Bramley was a student living in Switzerland, Martyn Matthews had been on a business trip and baby Julian Pracz-Bandres had been visiting his mothers' hometown in Spain. The mother of the 28-year-old student paid tribute to her son, after the Foreign Office confirmed he had been on board. Carol Bramley said: “Paul was a kind, caring and loving son." Another British victim was Martyn Matthews, a father-of-two from Wolverhamptin, who was flying back from a business trip to Spain when the airliner came down in south-west France. His 82-year-old mother, Iris, said today: "This has been a terrible shock. I am numb"
"Martyn was a lovely family man. He loved his work and travelled extensively for them. I don't want to say any more. It's too hard". Mr Matthews leaves a wife Sharon, 48, and two grown-up children. Sixty-seven of the passengers are believed to be German, and more than 40 are believed to be Spanish. There were also citizens from Australia, Japan, Colombia, Turkey, Denmark, the Netherlands and Belgium on board. Among the German casualties were 16 school pupils returning from an exchange trip. 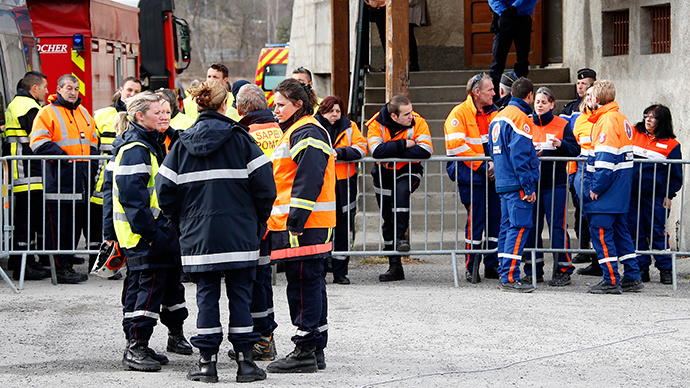 It was earlier confirmed on Tuesday that a UK resident of Spanish origin and her infant son were on board the Germanwings flight. Marina Bandres Lopez-Belio and her son Julian were UK residents, originally from Jaca in Spain, living in Manchester, northern England. Foreign Secretary Philip Hammond said: "We currently believe that three British people have been killed in this tragedy, but we can’t rule out the possibility that there are further British people involved. The level of information on the flight manifest doesn’t allow us to rule out that possibility until we’ve completed some further checks." "We are in contact with the families of those known to have been killed, we’re also in contact with the French, German and Spanish authorities and once we have a clearer picture we’ll make a further announcement," he added. The death of Lopez-Belio was announced by Mayor Victor Barrio, of her Spanish hometown, who said she was on the flight with her baby son Julian. She boarded the flight after being unable to find a direct route to Manchester. She had been in Barcelona for her uncle’s funeral, the Manchester Evening News reported. Her husband did not travel with Lopez-Belio, instead remaining in Manchester. Jaca's mayor, Victor Barrio, spoke to her family after learning of the tragedy. “I knew Marina well and I'm deeply affected by her death. She was a very well-known person in Jaca. “It's a terrible blow, I'm absolutely speechless. She came from an exceptional family who are going to suffer a lot with a terrible loss like this,” he said. Officials say there were no survivors of the crash. Authorities are hoping the black box, discovered Tuesday, would be able to provide information on the causes of the accident. French Interior Minister Bernard Cazeneuve said although the black box was damaged, it would still yield useful details. He also said UK Air Accident Investigation Branch and UK Disaster Victim Identification experts were on standby to aid the French authorities should they require assistance. The three British citizens on board the plane have not yet been named.